Following the successful delivery of the UK’s first ever multidisciplinary student conference on Antimicrobial Resistance (AMR) last year! 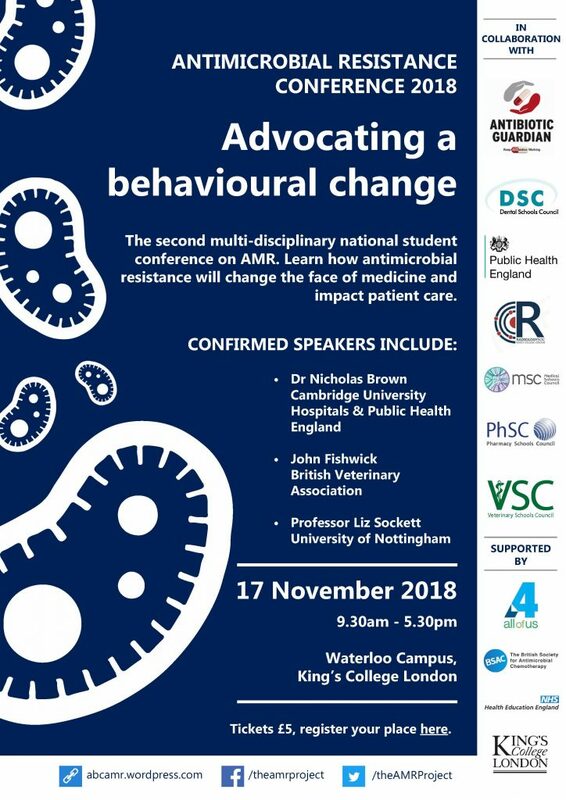 The national student conference on AMR returns for the second year. Providing a rare and exciting opportunity for students and young professionals in all areas of healthcare to learn and participate in discussion about this serious global threat. The conference aims to promote collaboration amongst all health-related fields through a One Health approach. All attendants can look forward to an engaging and interactive day. This event has been designed by students and for students, with talks and workshops delivered by key individuals in this field, in a very dynamic style. This conference will enable you as healthcare professionals of today and tomorrow, to be equipped with an array of knowledge, interpersonal skills, and an insight into the front line in the battle against AMR. All delegates will receive a certificate of attendance at the end of the conference.